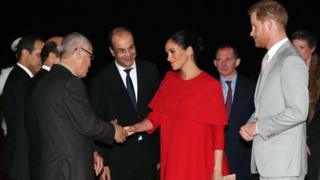 The royal couple’s three-day trip is aimed at strengthening the UK’s links with Morocco – which is one of the few stable countries in the region. Their visit will also focus on gender equality, with the pair discussing Morocco’s attitudes towards women with British ambassador Thomas Reilly. Mr Reilly said the issue is “close to their royal highnesses’ hearts”. 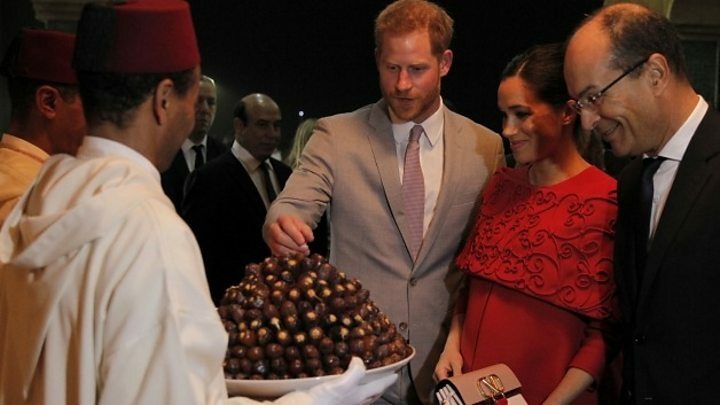 They entered the airport’s royal suite where they were offered the traditional welcome of milk and dates. Black limousines then took the duke and duchess – plus their entourage of nine, including a hairdresser – to meet Morocco’s Crown Prince Moulay Hassan. The couple are staying with Morocco’s King Mohammed VI at a royal residence. During their visit to Morocco – which will be an important market for the UK after Brexit – the pair will visit the famous Atlas Mountains and the country’s capital, Rabat. They will see a girls’ education project, meet young social entrepreneurs and visit programmes working with children with disabilities and those with mental health problems. Britain’s ambassador to Morocco, Mr Reilly, said: “I’m really excited to showcase the vital roles that girls’ education and youth employment are playing in shaping modern Morocco. “When we began planning for this visit, I had a very clear view in my mind of the story we wanted this visit to tell. It’s the same story we’ve been telling consistently at this embassy for the last 20 months since my arrival here. 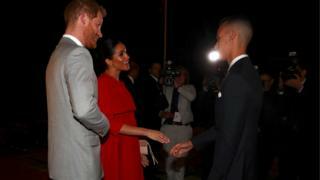 A Kensington Palace spokeswoman said the duke and duchess were “very much looking forward to the visit” and were “particularly pleased” they will be able to meet so many young Moroccans. Meghan is heavily pregnant with the couple’s first child. She reportedly travelled to New York earlier this month for her luxury baby shower with her friends, including some celebrities.